The Ring of Kerry, a Guided Tour. We hope you get some useful ideas here for your Ring of Kerry Day trip. Leaving Killarney by Saint Mary’s Cathedral drive for the Killorglin road (N 72), you will pass Killarney Golf Club on your left, keep going straight on to Killorglin you will also pass Ballymalis Castle about 14 km from Killarney on the left, it is a sister Castle to Blarney, Ballycarbery near Cahersiveen and Castlelough in Killarney in Rof the Lake Hotel. You will soon arrive in Killorglin famous for Puck Fair, a Pagan festival dating back 3000 years ( Celebrated on the 10 / 11 and 12th. of August each year). After Killorglin, you will also pass the Red Fox Inn and Traditional Bog Village Museum where you can see some Rural dwelling like those living in Ireland dated back in the 1800s. Next stop is Glenbeigh, it has a beautiful beach at Rossbeigh, 3 miles of sandy beach, head back to the N 70. Ahead the road joins the Atlantic Ocean where there is a Beautiful Ocean Vista is known as the Mountain Stage with great views of Dingle Bay, this is a good spot to stretch your legs and enjoy the view. Kells Bay is home to Kells Bay Gardens, a Sub Tropical experience and is also worth a visit a little further on. and hero to the Irish people in the 1800’s and still to this day, nearly every Town in Ireland has a statue of him of something that refers to him. Local visitor information can be found in the Old RIC Barracks the big white tower-like building near the town centre. The Barracks was built by the English and designed for India but they got the plans mixed up, there is be an Irish Castle type designed building in India to this present day. In this area of the Ring of Kerry, there are two Stone Forts dating back to the 9th. Century. You can also find Ballycabbery Castle (ruin) which is said to be haunted, it was blown up by Cromwell’s Forces from the inside out, once a fortress to The McCarthy Mór who ruled Munster. If you would like to visit Ballycarbery Castle and the Stone forts of Cahergal & Leacanabuaile cross the bridge by the RIC Barracks to what’s known locally as “Over the Water”. Leaving Caherciveen on your right-hand side you can see Valentia Island which can be accessed from Renard Pier by a Car Ferry to Knightstown and eventually exit at PORTMAGEE on a bridge. Here you have an option to do the “Skellig Ring”. The Skellig Ring is a great addition to the Ring of Kerry and we cannot recommend it enough but take note some of the roads are not suitable for Buses and only for cars and minivans. On the North road on Valentia there is an optional road (toll) up to Gokaun Mountain, here you can drive to the highest point on Valentia and from here you can see, County Cork to the South, The Skelligs to the Southwest. You can also see the Blasket Islands, the Dingle Peninsula to the West, and much of the Ring of Kerry to the East. As you head to the other end of the Island turn right for Saint Brendan’s Well and the Pub used in the Guinness TV add “Next Pint New York” painted on the side of it. Visit the Well but please stay away from the Cliff as the signs warn you too. The Cliffs in Valentia are prone to get more freak waves than anywhere in Europe, enjoy the Well and photos besides the so-called most western Pub in Europe. Near the Transatlantic monument up the hill, there is a car park and a nice walk up to Bray Head 2 km amazing views of the Skelligs and sea Cliffs, you can visit the Skellig Experience which is down near the bridge to Portmagee. When you go over the Bridge to Portmagee, Possibly Ireland’s most scenic fishing Village, the Bridge Bar is worth a visit or a lunch stop. Later on, continue to do the Skellig Ring via Coomanaspig Pass the highest drivable pass in Ireland on to Saint Finians Bay home of the Skellig Chocolate factory and it’s well worth a visit. At Saint Finian’s Bay, there is a beautiful beach if you roar “Up the Kingdom” at the Skelligs you will hear the Echo come right back. 😉 I think you have to do it 3 times. It’s on to Ballinskelligs after that and continues on following the signposts for Waterville. Heading on to Waterville turn right at the church and take the Coastal road into Waterville. Here you have a great view of the Ballinskellig’s Bay. Waterville was and is very popular with people like Charlie Chaplin, Shirley McClaine, Walt Disney, Tiger Woods, Payne Stuart and Michael Jordan, Catherine Zeta-Jones to name a few. It’s a quiet Seaside Town, yet steeped in History and has many Ancient Standing Stones, Forts and Legendary tales of days gone by. You can get your photo taken with a statue of Charlie Chaplin and more recently Kerry GAA great Micko O’Dwyer. The Fishermans Bar in the Butler Arms Hotel is a nice place to stop for lunch, it is here the Huggard family has welcomed some of the most famous people from all over the world for their renowned hospitality at one stage the Huggard’s employed more than half the population of Waterville form here the Bay View hotel and the Huggard’s Stores at the end of the village along with Shooting guides & Fishing Ghillies. The walls in the Butler Arms hotel are quite interesting and if you visit Saint Michael’s Church there is local history there including the Butler’s, John Mulcahy, and the Trans Atlantic Cable. to the north Ballinskelligs Bay and to the south Caherdaniel, Derrynane and Castle Cove, in the far distance, you can see County Cork. If it is a nice day go to Derrynane Beach, misty or rain visit Derrynane House once home to Daniel O’Connell the Liberator and is now a museum and open to the public. After Caherdaniel you can visit Staigue Fort ( 2500 years old ) its a left turn just before Castle Cove is also open to the public and admission is free. The road for Killarney in beside the Statue of Steve Casey for Molls Gap you can also go on to Kenmare, either way you will have a good view of the Mountains of Kerry, when you get to Molls Gap and you will see lakes in the distance on your left the Black Valley and the Head of the Gap ( the Gap of Dunloe ) in the distance. At Ladies View, you can see the Lake Hotel, that white building in the distance and as you descend you can see the Three Lakes of Killarney. You will pass the Upper Lake and the Middle Lake before you get to Torc Waterfall on your right and then on to Muckross House and Gardens, well worth a visit and stretch those legs after a great day. All that is left is, back to the ” Lake Hotel ” and Shower / Bath / or relax in a Jacuzzi or head straight to the Pub. You could also use the Outdoor Jacuzzi overlooking the Ring of Kerry and the Killarney National Park, then a relaxing drink in the Devil’s Punchbowl Bar overlooking the Floodlit Castle and Lake, and its time for dinner in The Castlelough Restaurant our Lakeside Bistro / Pub. New in 2015 Huggard 1912 Craft Beer is now being served in our Pub. The Lake Hotel is ideal Ring of Kerry Hotel Accommodation, situated on the Ring of Kerry and next to the Killarney National Park. Vacation Killarney recommend visitors take a look at our map it only gives a brief description of what’s on the Ring of Kerry but if you go to the points we mention it will open up many other points of interest. 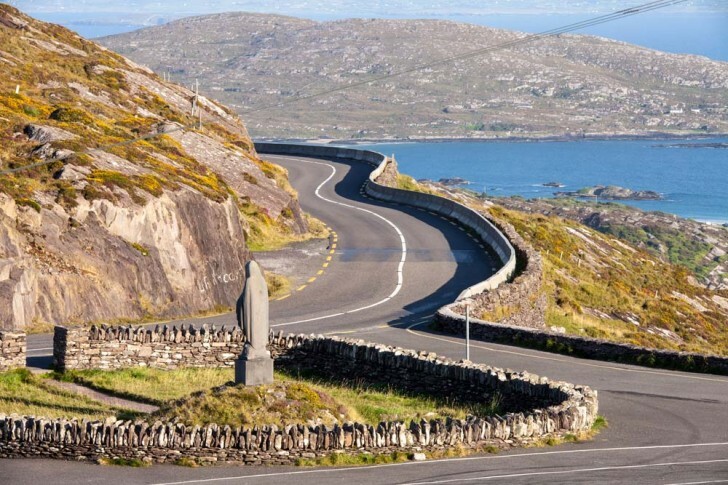 Did you know the Ring of Kerry was recently voted in the top ten most scenic drives in the World!